US, 2007, 98 minutes, Colour. Catherine Keener, Ellen Page, Hayley Mc Farland, Nick Searcy, Romy Rosemont, Ari Graynor, Scout Taylor- Compton, Tristan Jarred, Bradley Whitford, Michael O' Keefe. Directed by Tom O' Haver. 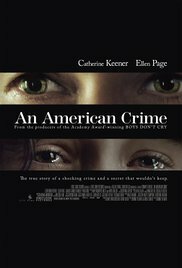 An American Crime is a striking film, the re-creation of a terrible experience of torture, punishment and death of a teenage girl in Indiana in the 1960s. The film notes that the testimony of various characters is based on court proceedings. But, there is also a disclaimer at the end of the film of the writers fictionalising some aspects and characters. Catherine Keener gives a frighteningly persuasive performance as Gertrude, the mother of six children, unwell, without main income, taking on two neighbouring children and caring for them while their parents were on circuit with a carnival. Trying to deal with her own children, especially the oldest daughter, Paula, and being frightened that she will become pregnant at a young age, Gertrude begins to punish the two sisters in her care. When Paula is discovered to be pregnant and Sylvia tells the prospective father, Paula complains to her mother who then proceeds to punish Sylvia, the punishment becoming worse and worse, slaps, beatings, cigarette burns, and finally an inscription on her abdomen, carved, “I am a prostitute and proud of it”. A young Ellen Page, about the time of her making Juno, also gives a strong performance as Sylvia. There are some guest appearances with Bradley Whitford as the prosecutor in the court sequences and Michael O’ Keefe as the local pastor, the Church playing an important role in the family’s lives. Directed Tom O’ Haver and his writing partner, Irene Turner, also introduce some fantasy aspects to the screenplay, the narration by Sylvia, her memories of the merry-go-round, a striking sequence where she seems to be rescued by Paula and driven to see her parents and being taken back to the home where she goes back inside – whereas, in reality, she is dead. And a final seeing returns to the merry-go-round. The film is difficult viewing, especially the torture sequences, the hardness of the allegedly religious housewife and mother, who finally denies everything in the courts, and the sufferings of the teenage girl. There was some criticism that the writers softened the character of Gertrude and Paula – but audiences are in no doubt about their callousness and the justice of their sentences. 1. The title, the crime, the particularly American nature? Family crime? Indiana and the midwest? The 1960s? 2. The screenplay based on court proceedings and testimony? The final disclaimer about fictionalising some aspects and characters? 3. The city, the streets, the house, the basement? The church? 4. The realism of the story? But the narration by Sylvia, her reflections on the merry-go-round, the fantasy sequence of Paula helping her, her escape, Ricky driving her to her parents, their response, driving her back – and her going into the house again? Dead? The final sequence, once again the merry-go-round? 5. The court sequences, the prosecutor, his interrogations, Sylvia’s parents and the explanation of their activity at the time, Jennifer and her going into the house with Sylvia, Gertrude, the children? All interrogated – and the intercutting of these scenes with the narrative? 6. Sylvia, Jennifer, their parents, going on the circuit, carnival, being away, the difficulties, sending the cheques, writing the letters – and Gertrude concealing this? 7. The two girls, going to the church, the experience of the church, the importance of the church and Gertrude’s religiosity, the sermons from the pastor, the parishioners, the bus? Going to school? Jennifer and her polio and the children’s curiosity? Their ages, dependent on their parents, Gertrude as a guardian? 8. Gertrude, illness, her husband leaving her, her liaison with Andy, the five children, the new baby? Trying to cope? Her wariness, worries? Giving the money to Andy for his trip? Relying on Paula and her income? The characters of the other children, boys, girls? The discipline, her beatings? Beating Sylvia and Jennifer? The two girls winging their parents, Gertrude’s punishing them? 9. Life at home, everybody together, the family meetings, Paula and the outings, going to the shop, her boyfriend, at the carnival? Paula confronting the boyfriend, Sylvia mentioning that she was pregnant? Paula’s anger, and denouncing Sylvia to Gertrude? 10. The rumours, Gertrude’s reactions? Gertrude and her interrogation of Sylvia, blame, slapping her, Sylvia becoming the victims, the torture, hitting, the burns, to the basement, the other children and their burning her? Ricky and carving the statement on her abdomen? Sylvia’s death? 11. Ricky, befriending Gertrude, the cigarettes, his participating and the torture? 12. Jennifer, her fears, not speaking out? 13. The other children, the devotion to their mother, punishing Sylvia because their mother said so? Paula and her harshness? 14. Andy, relationship with Gertrude, telling her about the pregnancy, the pregnancy test, Gertrude continuing to deny it? 15. The pastor and his visits, suspicions? 16. The realism and audience sympathies with Sylvia, antagonism towards Gertrude, towards the children? 17. The court, the prosecuting interrogating Gertrude, the continuing to lie, even saying that her children, who will watching, had lied? 18. The information at the end, Gertrude guilty, 20 years in jail, seeming to repent at the end? The subsequent history of the children? 19. The effect of audiences watching this experience of children, Sylvia, torture and death, the callous discipline?